On a sunny winter afternoon some twenty years ago, I was standing at the gates of the venerable main buildings of Sydney Boys High School, chatting with Tony Hannon, the knowledgeable and intense English teacher and long-time coach of the school’s First XV. A tiny Vietnamese boy carrying a violin case eased his way past us. He was joking, and we both had a good laugh because it was a good joke. And like all good jokes it was grounded in real life. The fact was that, more and more, Asian kids were moving into Sydney Boys High, and rightly so as they had the academic qualifications and potential to make the most of their education at the selective high school. Unfortunately, though, most of these boys were far too small for rugby, even if they were interested in playing the rough game, which they weren’t. For all practical purposes, then, the sight of the High boys in the blue and brown stripes playing out their hearts at Mackay Oval and the other GPS venues, and generally losing more games than they won, is now relegated to the sepia-recesses of the collective memories of those who played over the years and those of us, parents, family members and old boys, who loved to watch the teams go round in one of the oldest schoolboys tournaments in world sport. Wikipedia has a list (unfortunately one that needs updating) of sports stars who have come out of Sydney Boys High School. In the rugby category, there are some recognisable names: John Brass, Phil Smith (his partner at SBHS and in the Wallabies, who is not on the list), Bob Dywer, Alan Gaffney, Peter Johnson, Jason Jones-Hughes (a centre for Australia and Wales), Duncan McRae, Marc Stcherbina, John Thornett (one of the greatest Wallabies), Chris Whitaker, Jamie Holbrook (not on the list) and Craig Wing. Those players on the list who were at SBHS in the last twenty years were all products of Tony Hannon’s inspired and generous coaching. And the mark of all of them? They were all backs, which was a consequence of clever coaching and the fact that they played behind beaten packs. As a result, they were resilient and intent on doing something with the ball when they had it in their hand. The steepling kick was safely caught by McRae. The captain hurtled forward to knock him over. At the last moment, like a matador evading a charging bull, McRae deftly faked to move right and moved silkily to his left. And the captain charged on past him as McRae ran up the field to set up a strong counter-attack. Then there was the time when High went to the fabled fields of St Joseph’s College Hunter’s Hill. The Joeys First XV put on an awesome display to defeat our boys (with Matt Burke leading the way) by 76-0. One other memory is of a bitterly cold day with Sydney Grammar playing High. A wiry, good-looking player at first five-eights absolutely carved up the Grammar defence and virtually won the game on his own. Time after time he burst through a strong defensive line to set up attacks and tries. So no more Craig Wings, no more John Thornett’s, no more the hundreds of Sydney kids who for over 100 years had that special thrill of pulling on the Sydney High School First XV jersey. 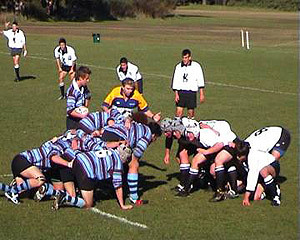 GPS rugby for Sydney Boys High School died this season but I don’t have to believe it if I don’t want to.